If you want to be the very best — and live in Europe — here's how to get there. The Pokémon Company International just announced European dates and details for the upcoming Pokémon Video Game National Championships, starting next year. 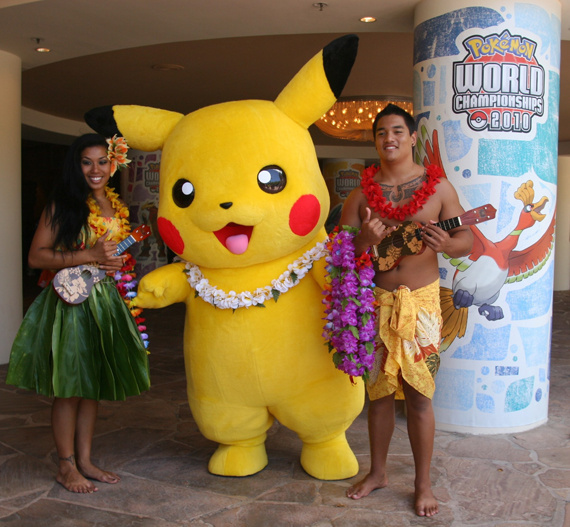 Players can use Pokémon from the National Pokédex — though certain Mythical and Legendary 'mons are banned — with the top four finishers in each age category winning travel and accommodation to next year's Pokémon World Championships in Hawaii. London, UK—December 2011— In exciting news for PokémonTM Trainers across Europe, The Pokémon Company International today announced the dates for the Pokémon Video Game National Championships, which take place from March 3rd through April 1st, 2012, in five major cities throughout Europe, including Birmingham, United Kingdom; Essen, Germany; Paris, France; Madrid, Spain; and Milan, Italy. Players will compete in three age divisions based on their year of birth. New for each of the five 2012 Pokémon Video Game National Championships European events: a total of four top finishers from each age division, up from two last year, will win travel and accommodation for the 2012 Pokémon World Championships held August 10th–12th, 2012, in Hawaii, U.S.A. Players under the age of 18 will also receive travel and accommodation for one accompanying adult. New for this year, players can build their teams using Pokémon from the National Pokédex[i] and must play using the Pokémon Black Version or Pokémon White Version video games for the Nintendo 3DSTM and Nintendo DSTM family of systems. All tournaments are free to play with entry granted on a first-come, first-served basis. Space will be capped so players are encouraged to arrive early for registration. At all European National locations, the Masters Division line opens at 8:00 a.m. and closes at 8:30 a.m. the Junior and Senior lines open at 12:30 p.m. and close at 1:00 p.m. Go to www.pokemon.co.uk/vgc to review caps on the number of entrants at the National qualifiers for the 2012 Pokémon Video Game Championships. The tournament will use Double Battles and will take place via Infrared Connection; competitors taking part at the European qualifying events may only use European versions of the video games and must have a Player ID to participate. If players have a Pokémon Trainer Club account but do not have a Player ID, they can obtain one by logging into their account and visiting https://www.pokemon.com/uk/account/upgrade2/. Competitors must bring their Player ID to their event to compete. For more information about the Pokémon Video Game National Championships, including full conditions of entry, tournament locations, dates and times, prizes, and more, please visit: www.pokemon.co.uk/vgc. Does Hawaiian Pikachu know Surf? I never wanted to be Pikachu. All of a sudden this has changed now. Meh... I've BEEN to Hawaii already! Lucky me!